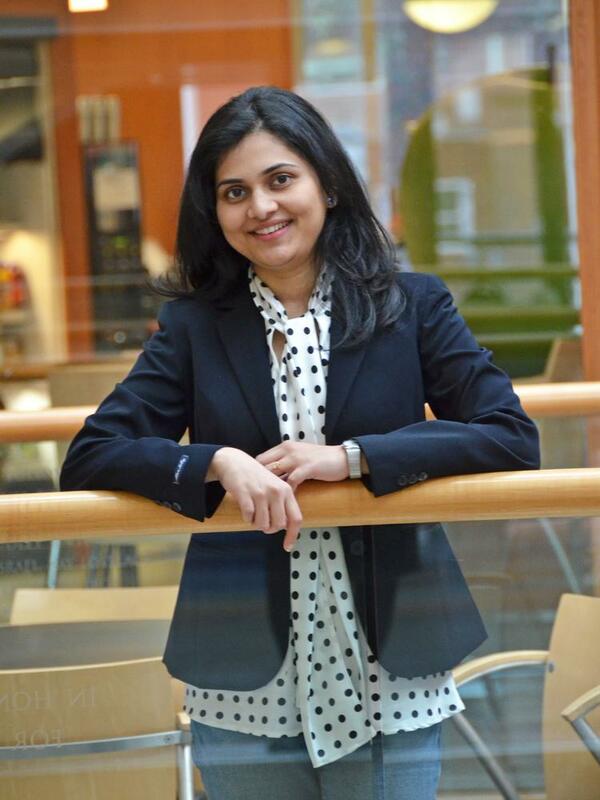 An interview with UNC-Chapel Hill doctoral candidate Mugdha Gokhale, the recent recipient of Forbes magazine’s “30 Under 30: Healthcare” award. Mugdha Gokhale sat on a plane headed to Raleigh with her husband and 1-year-old daughter when an email from Forbes magazine popped up in her inbox. “Congrats!” it announced. She read on to learn she’d been nominated for and received a “30 Under 30: Healthcare” award — given to the “brightest young entrepreneurs, breakout talents, and change agents” in the field. “I was shocked and excited,” Gokhale, a doctoral candidate in the epidemiology program at the UNC-Chapel Hill Gillings School of Global Public Health, says. Her award-winning research observed diabetic patients taking a particular class of drugs. The study was the first of its kind to show that the risk for pancreatic cancer in these patients was not elevated — a discovery that eased previous concerns from less rigorous study designs. Gokhale attributes her win to UNC-Chapel Hill’s epidemiology program and professors. “They were instrumental in shaping my research,” she says. “They’re the reason I’m such a good researcher.” Endeavors sat down with Gokhale to learn more about her win and research. Here’s what she had to say. Endeavors: Why is drug safety research so important? Mugdha Gokhale: Because a lot of people don’t know the real side effects for drugs — and how common they are — just by watching a television commercial. Drug safety research puts that information out there, especially for common conditions like diabetes and obesity, which affect millions of people. It helps them learn what drug options are available so they can discuss options with their physicians to, together, decide which drug is the right fit for them. E: Please share more information about your award-winning research. MG: I study the safety and effectiveness of antidiabetic medications with respect to several health outcomes using observation research methods and insurance claims databases. These are the claims collected by insurance companies for administrative purposes, and provide information for medications used, health conditions diagnosed, and demographic and socioeconomic information. My team and I focused on drugs for diabetics because we think diabetes is a condition a lot of people are affected by — and it can almost be called an epidemic. E: How can this research impact the population at large? MG: Our research is based on millions of patients who use these drugs in the real world as their physicians prescribe them. It reflects real-world drug use patterns and how those drugs are affecting people. This research has a great public health implication because it is relevant for physicians who have to make treatment choices on a daily basis. E: What’s an interesting fact you discovered while doing this research? MG: The amount of time that patients are on one particular antidiabetic drug is short. One would expect that people take these drugs for a long time given the chronic nature of the disease. There is a lot of switching or augmentation between different drug classes. This should be put into perspective while interpreting the results of studies done using health utilization data — particularly those that look at long-term outcomes like cancer, which takes a long time to develop. E: What made you want to be a scientist? How’d you get into epidemiology? MG: I received a bachelor’s degree in pharmacy while in India. That’s when I began thinking more and more about how pharmacists dispense drugs to the public. I was more interested in how these drugs, once marketed, affect patients. What are the benefits and the risks? That is what attracted me to the epidemiology program at UNC. E: What would you like to see happen in the future for your research? MG: Not many schools offer specialized programs in pharmacoepidemiology (the study of the uses and effects of drugs in large populations). This research can have a huge impact on patients, so I’d love to see more programs develop and collaborate with each other, as well as increased funding from government agencies for such studies. I’d also really like to acknowledge the great program at UNC. Professors Til Stürmer and John Buse were instrumental in shaping my research, and were incredibly encouraging. It’s because of them that I’m such a good researcher and received this award from Forbes. Mugdha Gokhale is a doctoral candidate in epidemiology at the Gillings School of Global Public Health.